We’re excited and proud to share a website we recently designed and developed for Public Sector Partners. Public Sector Partners hosts forums that address issues in the California government that revolve around information technology needs. Their website can be viewed Here. When we first met with Public Sector Partners, we discovered that they needed a new logo and website. First, we began with the logo. It was important for their logo to represent a connection between private and public sectors as well as forward movement within those connections. The solution was two overlapping and transparent circles, each a different color but joining in the middle to form one color. In the middle of these circles is an arch representing a reach forward and into the future. This new logo was a big update for Public Sector Partners and modernized the look of their brand, especially online. Once their logo was complete, we jumped into designing Public Sector Partner’s new website. When designing their website, we retained their new branding styles and colors used in their new logo. To do this, we made grey and blue the main colors of the website and utilized the bright green in the logo as important buttons on the website such as “Register Now” on the event pages. 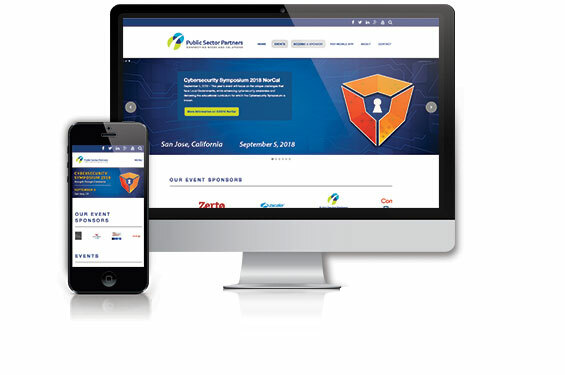 The Public Sector Partners website needed to be a one-stop shop for all things about their events whether it’s for general information, registering for events, past event videos and photos, and much more. The first step was organizing all of the information. The home page of the website features the most important information; links to sign up, links to upcoming and previous events, a featured video, testimonials, and sponsors. Additionally, it’s easy for users to find their social media page links and search their website at the top of their website. The main focus of Public Sector Partners’ website are the event pages and the signup form pages. Because of that, it was even more important for these pages to be easy to navigate and the information had to be organized so that visitors could use the pages and forms easily. Each of these pages have clean layouts built on a grid which increases the quality of user experience and encourages visitors to stay on their website longer. The complexity of Public Sector Partners’ website needed to be simplified to make it easy to use for everyone, across all devices. We accomplished that by having a secondary main navigation for each event and designing the website with a responsive layout which response to the size of the device that visitors are viewing it on. It’s our commitment at Friday Marketing to deliver websites with results to our clients and we’re proud to have designed and developed the new website for Public Sector Partners.